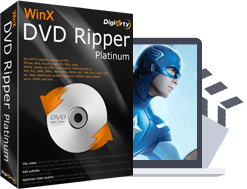 No.1 fast DVD ripping solution to rip DVD/ISO image to mainstream videos incl. AVI, MP4, MPEG, WMV, MOV, FLV, M2TS, etc. By digitizing the content in DVD disc, it makes all types of DVDs seamlessly compatible with iPhone, iPod, iPad, Apple TV, iTunes, Android, Samsung, Huawei, HTC, Surface, Xbox, Chromecast, etc. It also empowers you to 1:1 clone DVD to ISO image/DVD folder and back up DVD main content and title. Download, edit, transcode and record videos at one go. 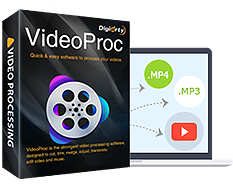 Convert compress 4K, MKV, AVCHD, M2TS, AVI, MPEG, MP4, HEVC, MOV, WMV, as well as audios and DVDs for playing on iPhone, iPad, iTunes, Xbox, PSP, Chromecast, etc. Cut, trim, merge, adjust, and edit (4K) videos. Download videos from 1000+ sites. Enable multiple CPU cores, Intel QSV and CUDA/NVENC to accelerate conversion speed, up to 64x real time. First-rank DVD ripping and backup software for macOS. Support all sorts of DVDs. Convert DVDs to MP4, H.264, MKV, MOV, FLV, iTunes videos for playback on iPhone, iPad, iPod, Apple TV, iTunes, QuickTime Player. Fast convert videos, audios and DVDs. Compress large 4K / 1080p videos MKV, M2TS, AVCHD, H.264, HEVC, AVI, MP4, MOV, etc. Edit, cut, crop, merge, rotate and adjust videos. Download videos and music; record videos easily. All-in-one DVD backup software. 1:1 clone DVD to DVD disc, DVD to ISO image or DVD to MPEG file with original video tracks and original AC3/DTS Dolby audio. Support old, new DVDs, and even damaged discs. Your ultimate iPhone/iPad manager software. 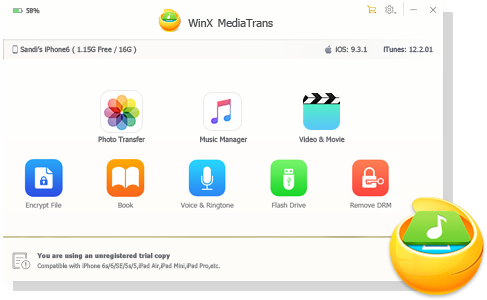 Manage and transfer iOS files to PC and vice versa, no matter your targets are photos, videos, music, ringtones, iBooks or others. Sync what you want without iTunes. Ideal software to rip and sync DVD to iPhone. Also support iPad & Apple TV. Watch DVD movie on iDevices anytime, anywhere. Embedded with High Quality Engine, it delivers untouched output quality. A complete solution to convert Ultra HD 4K videos, MKV, AVCHD, MTS/M2TS, MOD and regular videos AVI, MPEG, WMV, MOV, FLV, etc. for playing on iPhone. Also support iPad, Apple TV (HD) and iTunes. A well-designed video converter for mobile, especially for Android phones/tablets. Convert any video to Samsung Galaxy Note/Edge, HTC One, Google Nexus, iPhone, iPad, etc. Merge, crop, trim and add *.srt subtitle. Download online videos & music from 300+ video sites. Auto detect video, resolution, format with corresponding size. Choose an output and click Download, you can have the full video on your PC in a few seconds.